Both of those articles have focused on Team Site blogs. However, what you may not realise is that every SharePoint Online user has the ability to create and publish to their own personal blog. 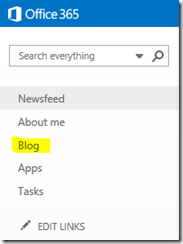 The SharePoint Online personal blog is provided via OneDrive for Business however users go to their Newsfeed to enable it. By default, a users personal blog does not get automatically created. To create their blog they need to visit their Newsfeed from the menu along the top of their web portal. From the menu on the left hand side they simply select Blog under About Me. In the top right of the page they will probably briefly see an indication that their blog site is being created as noted by the Working on it… message. In a matter of moments the new personal blog site will be created and the page will display the location. So where does the blog site actually get created? Well, if you have a look at the contents of the users OneDrive for Business site (by selecting the Cog in the top right hand corner) and scrolling down to the bottom of the page you will see a subsite called Blog as shown above. which you can now post articles to via the browser or via the desktop which I covered in previous posts. If the user returns to their Newsfeed they will also find that they have been configured to automatically ‘follow’ their blog so updates will appear in their Newsfeed. If you look at the permissions for the newly created user blog, you will see that by default Everyone except external users (i.e. 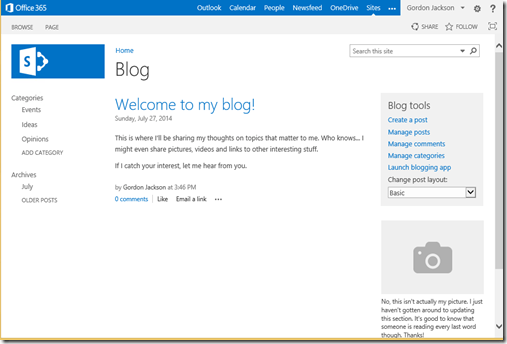 other Office 365 users) can view the content in the blog. 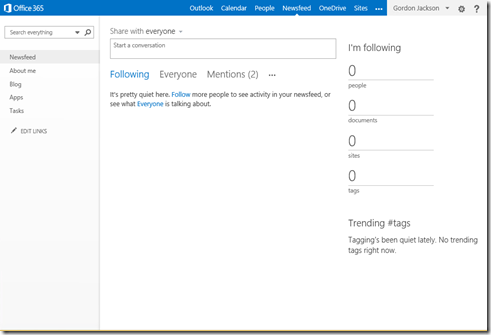 you will see the difference is that other Office 365 users have the ability to add comments to any blog post by default (since they have Contribute rights here). 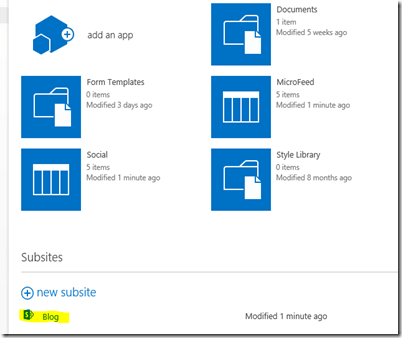 This means that when an Office 365 user creates a personal blog by selecting the menu option in their Newsfeed, they are able to publish posts that all other Office 365 users can not only view but also comment on. The personal blog is something that I believe should be encouraged within a business and you can see it easy for users to setup and publish to. Importantly, all the information that is published in blogs is index by SharePoint Online and can be found using the search facilities. That is why it is so valuable. rather than having people take notes, have them blog the information.